Thanks to this 100% web-based application incorporating a complete make-over of its ergonomics, Alma enables any user to evaluate the performance of the Powernest nesting engine in a few seconds, using their own parts. In 2013 Alma made available a free application on its website, making it possible to carry out a very simple test of automatic nesting of 2D parts of any shape, by downloading your own DXF files. A new version of this 100% web-based demonstrator in the cloud has just been put on line. 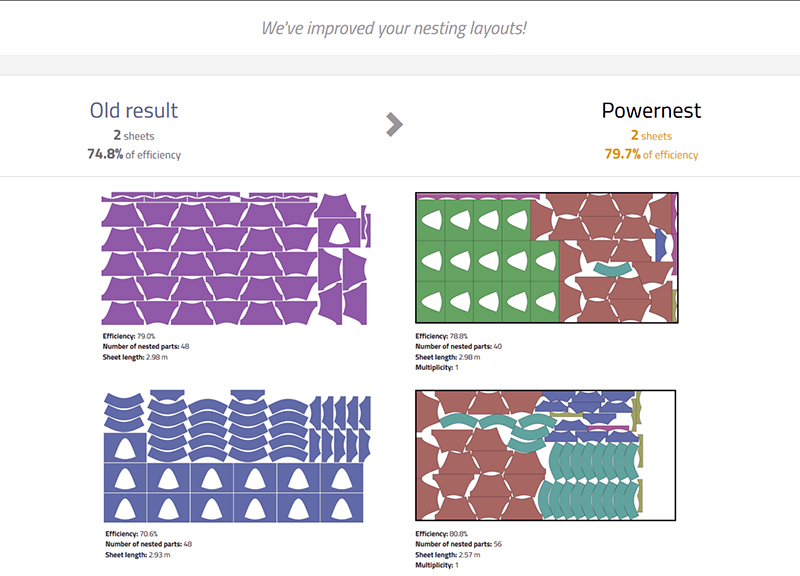 Powernest Demo is designed to demonstrate the performance of Alma’s automatic nesting algorithms. These algorithms are commercialized under the Powernest brand as software components that can be integrated into a third party software (CAD/CAM, ERP, quotation, etc. ), or into the new almaCAM software distributed via the Alma retail network to end users. Special focus has been placed on the ergonomics of this new demonstrator, to make it even easier to get started. A few clicks is all it takes to start nesting automatically, using either the user’s DXF files or parts supplied with the application. Configuration tasks have been minimized: space between parts, choice of one option from three possibilities to authorize parts rotation and choose the computation time. Computation is performed in the cloud and the results are displayed on screen. They can therefore be compared to those obtained with other software. Powernest Demo offers a new and very useful functionality. Users can send a DXF of a nesting layout they’ve already performed; the demonstrator identifies the parts and sheets and performs the nesting again, completely automatically! Powernest Demo not only produces a good result in a few seconds, it also enables users to lengthen the computation time to further increase nesting efficiency. This is where the virtually unlimited computation capacity of the cloud really comes into play. Of course there is no need to install any software, and there are no more configuration issues (firewall, anti-virus, etc.). In addition the application is fully responsive, in other words it is designed to run not only on computers but also in mobile environments and on smart phones. This demonstrator is based on Powernest WS, the new automatic nesting service in the cloud from Alma. Until recently the Powernest library was available only as a DLL using a license business model, but now it is also available in SaaS mode (Software as a Service) on a pay-per-use basis, in other words payment for each nesting performed. There are many advantages to this new offering, both for the independent software vendor who integrates Alma’s algorithms and for its customers, the end users of the cloud service: reduced entry and maintenance costs, better nesting performance through control of the computing power of machines in the cloud, transparent algorithm updates, improved service availability, pricing flexibility, etc. The Powernest component is available in several versions depending on the kind of parts and the type of nesting performed. Powernest Lib and Powernest WS are used for 2D nesting of any kind of shape (cutting of materials in plates or coils), Powernest Square is intended for edge to edge rectangular or linear cutting (sheet-metal shearing, wood-panel cutting, bars, profiles or tubes sawing, etc.) and Powernest Cube is designed for 3D nesting of parallelepipedic shapes (cutting foam, stone, wood, etc.). Alma is the only independent software vendor that develops and sells not only nesting algorithms in the form of components but also CAD/CAM software applications to program cutting machines. These two activities, which are mutually enriched by invaluable technical expertise and give Alma complete mastery of its products, make it possible to build a bespoke offering perfect for every kind of customer: CAD/CAM or ERP independent software vendors, cutting machine manufacturers, industrial end users, etc. 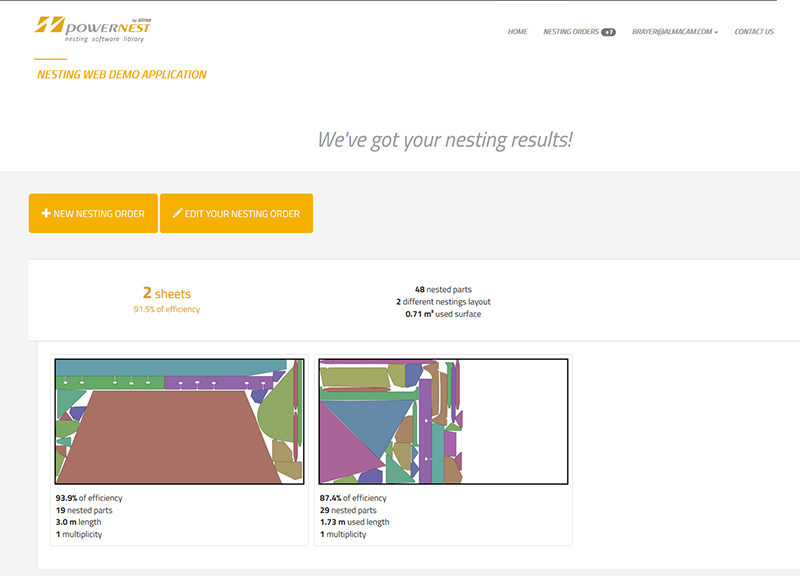 By tackling all the technological issues associated with nesting by means of a « concentric » offering (from supplying a single engine to supplying the complete CAD/CAM cutting software) and by offering the Powernest component in « on-premises » mode and SaaS mode, Alma fulfills every need and more than ever is positioned as the worldwide specialist in automatic nesting for cutting.